Happy thanksgiving! I thought I would share a quick post with you all for one of the dishes I’m making for our family’s thanksgiving dinner. 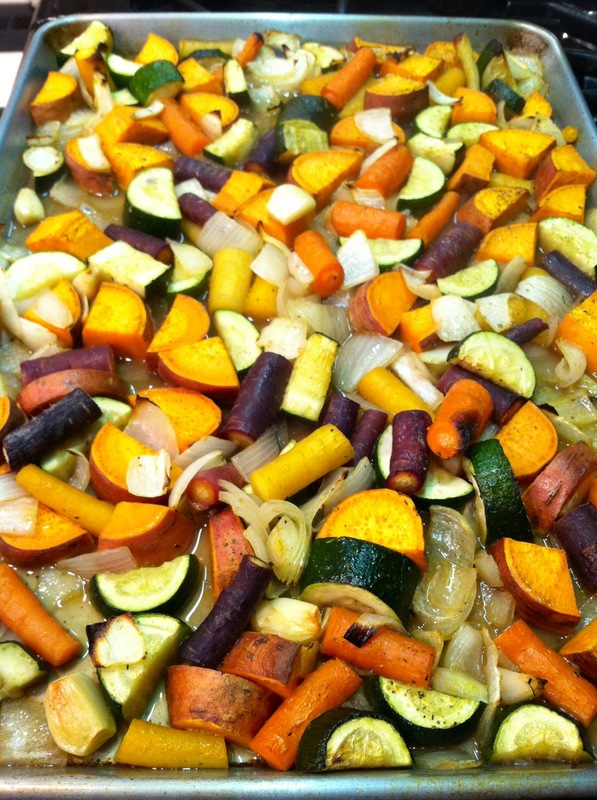 This simple recipe combines chopped yams, zucchini, carrots, onion, and garlic with herbs and vegetable broth to give you amazing, moist, oven roasted vegetables! Start by washing all of your vegetables. Carefully wash your zucchini and carrots. Also wash and gently scrub your yams to ensure there is no dirt remaining on them. Then you can chop all of your vegetables and put them into a large mixing bowl. This includes chopping your washed zucchini, carrots and yams into smaller pieces, as well as chopping your onion. You will also need six whole cloves of garlic to add in to the mixing bowl. Put enough olive oil on your vegetables to coat them. This should be a couple tablespoons, not much but enough. Then add in your seasoning of choice. I used one tablespoon of Simply Organic’s all-purpose seasoning with onion, black pepper, garlic, parsley, celery seed, tomato powder, basil, thyme, oregano, sage and coriander. Gently mix your vegetables in the large mixing bowl and then pour into a baking sheet. Spread evenly across the pan. Then add in your vegetable broth. You should pour in enough to fill up about 1/4 of your baking sheet. This took me about two cups of vegetable broth, but it will depend on the size of your baking pan. 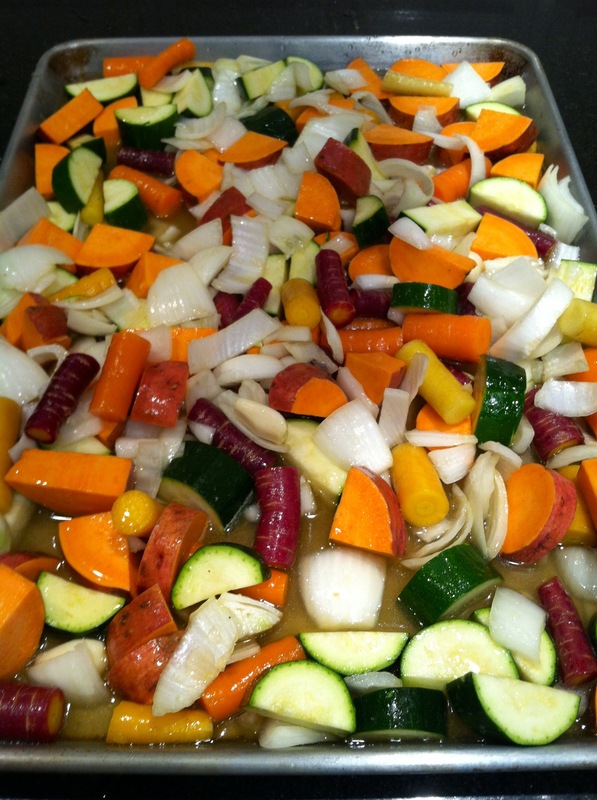 This broth will help add some additional flavors to the vegetables while roasting and allows them to stay moist. Once done, you can enjoy as a side dish with your other delicious thanksgiving food! These oven roasted vegetables are also really great over cous cous. No matter how you choose to pair these oven roasted vegetables, I hope you enjoy! One serving of these delicious oven roasted vegetables will give you 170 calories and 33 grams of carbohydrates, 6 grams being dietary fiber. It will also give you 971 milligrams of potassium and 2 grams of protein. In terms of vitamins, you’ll be receiving 5% of your daily vitamin E, 19% of your daily vitamin B-6, 30% of your daily vitamin C, and over 200% of your daily vitamin A. These oven roasted vegetables will also give you lots of minerals. Some of those include: 10% of your daily folate, 11% of your daily copper, and 28% of your daily manganese.